In 2005, when George Buckley stepped down as head of Lake Forest, Illinois–based Brunswick Corporation—the world’s largest recreational-powerboat manufacturer, whose multiple brands were then achieving record sales—he didn’t disappear into retirement. On the contrary, Buckley became chairman, president, and CEO of an even larger company: 3M, based in St. Paul, Minnesota. About four years along in that job, Buckley issued a “challenge” to 3M’s Occupational Health & Environmental Safety division (recently renamed Personal Safety division), asking personnel there to come up with an innovative but inexpensive disposable respirator. Results were expected as quickly as possible, thereby adding the pressure of a tight schedule to the R&D effort. Buckley’s challenge is noteworthy because 3M already produced its now-familiar “cup style” disposable—arguably the most popular low-cost line of disposable respirators on the commercial market—whose progenitor, which 3M introduced in 1972, was the first “filtering facepiece” respirator approved by NIOSH (National Institute for Occupational Safety and Health). Indeed, when Buckley issued his challenge, 3M’s disposable-respirator product line comprised nearly two-dozen distinct models, all NIOSH approved for different environments (and all involving particulates, but some involving oil and/or exposure time-limits). Keep in mind that none of the above takes into account 3M’s more expensive respirators, which for the marine industry alone include disposable half-face as well as reusable half- and full-face respirators. In the aggregate, they number some 10 separate series (each containing a family of models), equipped either with cartridge filters or “powered” air. Clearly, respirators are big business at 3M, whose personal protective gear has long been one of the top three best-selling marine product lines at the company (the other two are abrasives and tapes). 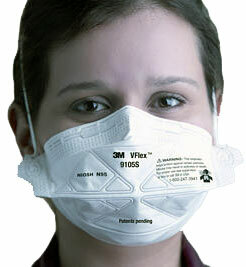 So, given 3M’s already extensive respirator array, why another low-cost disposable? The partial explanation is a longstanding culture of innovation at 3M; Buckley understood what buttons to push, in-house, to help make it happen. Another contributing factor is 3M’s global marketplace: Buckley sought a cost-competitive “entry level” respirator for workplaces in emerging economies where respiratory protection, if worn at all, is often a gauze mask or handkerchief. Let’s take a look at the finished product created by an eight-person development team assembled from within 3M’s P/S division to address Buckley’s challenge. Formally named the VFlex Particulate Respirator, its 3M model numbers are 9105 and 9105S; the “S” version is for smaller faces. The VFlex product carries a NIOSH “N95” designation, indicating service restricted for use “in those atmospheres free of oil aerosols”; the filter is “at least 95%…efficient when tested with ~0.3 µm sodium chloride aerosol.” In other words, a VFlex respirator can be safely worn where any “solid or liquid airborne particulate hazards” exist as long as they do not contain oil. While admittedly well short of universal application, this particular respirator nevertheless protects the wearer in a great many boat shop, yard, and manufacturing-plant spaces and processes. It folds flat. Most unvalved disposable respirators are pre-shaped, rather like a half-avocado shell, awaiting custom fitting around the bridge of the nose by the wearer. When not in use but still on, such respirators must be shifted out of the way, either to the top of the head, or to the side or back of the neck—an awkward accommodation. A previously developed foldable respirator, 3M’s three-panel 9210, whose geometry differs from the VFlex unit, pointed the way. “You build on what you know,” said Barrera. As its name suggests, the VFlex model’s v-shaped pleats flex with mouth movement for easier talking, and expand for easier breathing. An embedded adjustable aluminum noseclip helps provide a secure seal and custom fit. The embossed front panel enables the respirator to retain its shape once in place; the inside is then fairly spacious, with a negligible effect on sightlines. Two sizes fit a broad range of faces and are compatible with many types of safety eyewear and hearing protection. The elastic headbands are latex-free. Protruding tabs near their attachment points facilitate positioning the mask on one’s face. The VFlex product, launched before Buckley left 3M last year to join a Britain-based equity firm, debuted for the marine industry at the 2011 edition of IBEX, an acronym for the annual trade show founded and co-produced by Professional BoatBuilder magazine. In a large exhibit hall in Louisville, Kentucky, filled with hundreds of vendors, many of whom were displaying new or improved products more attractive than a humble if innovative respirator (including a monster 300-hp/224-kW Mercury outboard with electronic controls, from Buckley’s former employer, Brunswick Corporation), VFlex respirators at the 3M booth did not garner much attention from IBEX attendees. Note that the VFlex product has yet to appear in 3M’s master catalog for the marine industry (titled “Marine Products and Systems”), now primarily distributed online in digital format, so the VFlex model’s availability may still not be widely known at boat yards and builders, three years after its product launch. Not long ago, a crew from 3M’s P/S division paid a service call to Hatteras Yachts’ 90-acre (36-hectare) production facility in New Bern, North Carolina, to conduct on-site health-and-safety training. (See PBB No. 17 for a detailed description of the plant layout.) According to Eitzman, his 3M colleagues were favorably impressed that Hatteras employees “understood what to wear, where”—depending on physical location within the plant and the particular fabrication or finishing process occurring there. Hatteras, though currently for sale, is a Brunswick Corporation brand. George Buckley is not being credited for that upbeat on-site industrial-safety report. Still, it is telling that workers at Hatteras in the early 1960s—when Hatteras’s original High Point plant was the world’s leading producer of fiberglass powerboats over 30′ (9.1m) in length—virtually no one in the yard’s manufacturing areas wore personal protective gear. Why? Because not only did that era predate Brunswick’s acquisition of the boat company, it predated personal protective gear as we now know it, along with a growing collective consciousness to wear it. Too bad Barrera’s design team didn’t give the VFlex product one other feature: the ability to time travel. Back in the day, at every boat maintenance, repair, and new-build operation in the country, 3M’s simple but sophisticated respirator would have been a blessing for crews who, at the time, had no respiratory protection.